Since our release of Version 1.0 of our SEND model back at the beginning of the year, we’ve been hard at work looking at other places we can apply our model. One of Mastodon C’s core principles is being open source, and so we turned to open data! Our full model takes a local authority’s historic SEND transitions between needs and settings, and uses this information, along with associated costs, in order to project possible transitions and infer how the future SEND population will be composed. More information can be found here. There are a number of specific data points which only a local authority’s SEND service area can provide us with in order to make accurate future projections. However, with a limited amount of this data, as we have from SEN2 open data, our model is powerful enough to still give interesting insights. 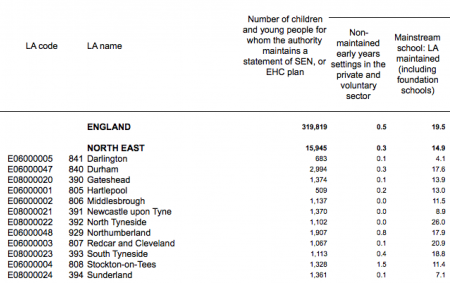 Every year local authorities are required to submit a report detailing the composition of their SEND population. This data is then published on the gov.uk website and made available to the public. The data here spans a number of years, so although there is no data linking how an individual may transition within the SEND system, there is a total count of individuals in particular SEND settings and how the number changes across time. Using this information we were able to adapt our SEND model to only project a total count of individuals in SEND and how that population is expected to break down by setting. What this “lightweight” version of our model is still able to do, is apply the basic principles of our methodology, simulating thousands of possible futures and aggregating the results to give an overview of the potential future SEND population, broken down by setting. With this we are able to project the possible future SEND populations of all local authorities in England. For more information and to learn more about what your own SEN2 projection looks like please contact us at theteam@mastodonc.com.